When it comes to styling and fashion for women, perhaps there is an aspect of it that is often overlooked by many in the particular field. Unfortunately, many women do not necessarily pay attention to the types of nail polish that they put on when going out into town. The nail polish that a woman chooses can have a great effect on her overall look and appeal. If the nail polish that is chosen consists of a color that matches a woman’s clothing or accessories, then it is highly likely she has a good sense of style. However, it’s also important to note that the color of nail polish isn’t always most important for the individual who applies it onto their fingernails to be aware of. It’s important to know about the range of colors both brands offer. Both of them are often utilized by nail salons and professional nail stylists. They’ve both been known to boast a vast range of colors. 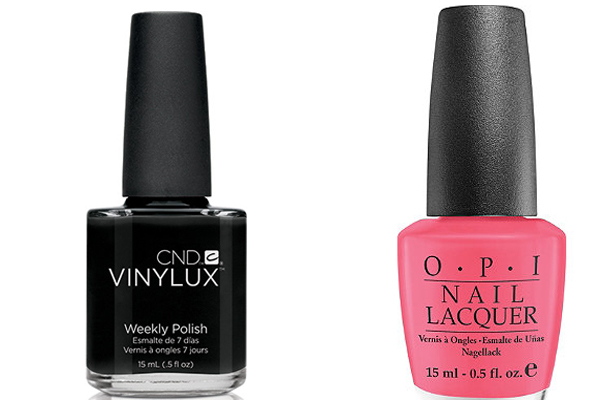 At the present time, CND Vinylux is available in more than 70 different shades; however, OPI is currently boasting an even larger number at 250 colors. OPI wins in this category. Longevity is another important factor when it comes to choosing nail polish. In this case, CND wins with a promise of 7 days without some of the preparation requirements that are entailed with OPI. OPI promises its product to last up to a week; however, requires the individual to invest in some accompanying forms of accessories, such as base coats and top coats to ensure protection of the polish. All fans of nail polish are often aware of color not being the most important attribute to their choice of product all of the time. The effects of their products also has tremendous impacts on their appeal. OPI offers many of the same glimmering shades that are available with CND, as well as metallic polishes. Perhaps its impressive 18k Gold top coat makes it the obvious choice of preference when it comes to effects. When it comes to determining which is the better choice between cnd vinylux vs opi, one may find that both offer impressive qualities that cannot necessarily be found elsewhere. We highly recommend the individual to decide for themselves which one suits their personality and choice of fashion the best. Both can be considered to be winners.